I am a big fan for long exposure photography and I have been practicing it for a couple of years; so when I heard of �The Long Exposure� eBook (by David Cleland), I didn�t want the miss the chance to read it hoping that, after all this time, I could still pick up a trick or two. I can say up front I was not deceived. The book is primarily written with the beginner in mind covering thoroughly, in 9 chapters over 32 pages, long exposure photography from gear to post processing. What is striking about the book is the simplicity in which David explains his workflow, there is no place for math or other brain boggling formulas rather practical explanation as you would expect from a one to one discussion with a friend or relative and, specially, lots and lots of examples. 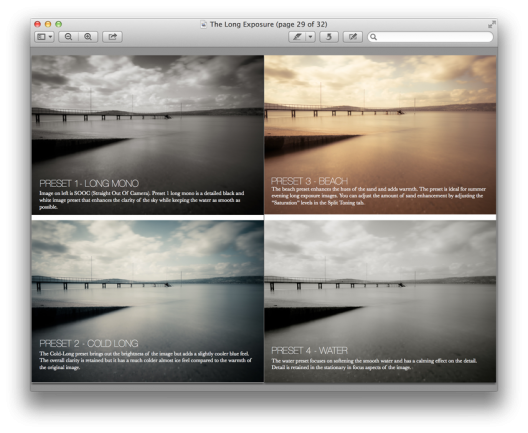 Add to all this 6 Adobe Lightroom presets, David includes with his eBook, and a section describing how to create your own preset, I guess it is pretty much a full course menu for only $5. Although I don�t consider myself a beginner is seascape photography, David�s tip about the use of clarity is retouching made me realize, over again, that I do lack a lot in the digital dark room and opened to me a lot of new possibilities with my pictures. 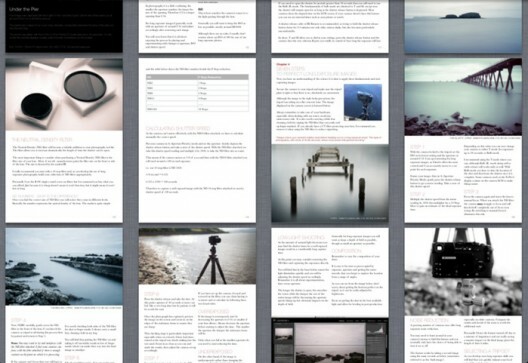 So if you like to test drive long exposure photography with minimal cost and equipment (like David reveals in his eBook), head now to flixelpix and enjoy your reading.